When my Mum suggested Sissinghurst as a place we might take her and Dad for their Golden Wedding Anniversary mini-break, I readily agreed. 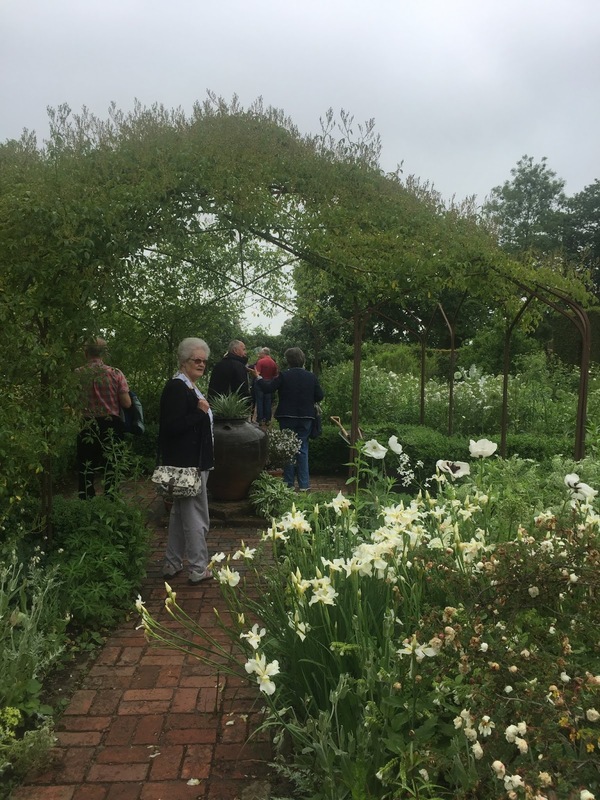 I was intrigued to see the famous white garden and the home of Harold Nicolson. Whilst most people have heard more about his wife, Vita Sackville-West, I had made an obscure connection with Harold through my A-Level History project way back in 1987. Researching the 1938 Munich conference led me to his diaries, where, as an English diplomat he had recorded his own accounts of the conference and its possible consequences. As I said, this was over 30 years ago, so it must have made an impression on me! Clearly when Harold was not busy being a diplomat, he was designing gardens! 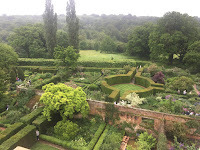 He was responsible for much of the planning of the Sissinghurst grounds. His wife Vita also had a two-pronged life: she gardened by day and was an author by night. 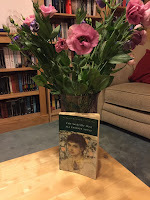 Prolific in her literary output, her books have not formed part of the popular canon of modern literature, and I was interested in reading a novel written by the woman I had first heard of as a gardener. 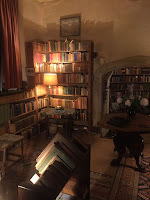 And so in full knowledge of my planned visit to the Kent "castle," I began to read All Passion Spent, a Sackville-West novel I had picked up a couple of years ago in the famous secondhand bookshop at Alnwick. The premise for this book appealed to the introverted part of my character: the part which needs a few hours solely and completely to myself in order to function at my best in other, more sociable areas of life! The novel opens with the death of Henry, the first Earl of Slane and thus we are introduced to his wife, who at the age of 88 finds herself single for the first time in 70 years. After decades as the obedient wife of a diplomat, (an autobiographical nod here, I presume, though obedience doesn't seem high on the Sackville-West agenda), Lady Slane refutes the plans that her children have for her to enjoy a meek widowhood living with each of them in turn. Instead, she travels independently by tube to a house she had fancied in her youth in Hampstead and she secures it for rent for a year. Appalled by this decision, the children nonetheless rally round and suggest a rota of visitors to ensure the well-being of their aged mother. And this is where introversion is at its best! 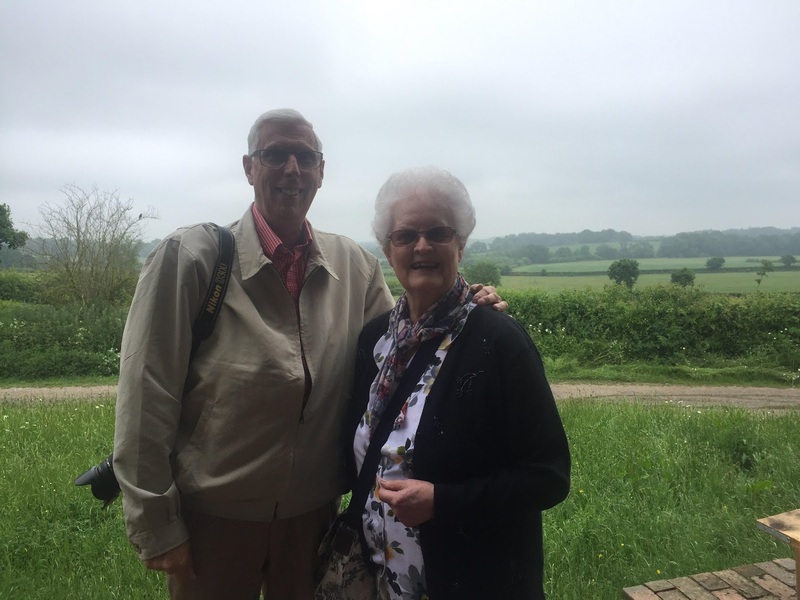 She refuses their offers and moreover, bans visits from her Great Grandchildren and her Grandchildren, stating that those under 70 years of age are too demanding and too tiring. She permits her offspring and their spouses, realising as she does so, that they won't keep up with the tedious need to travel out to see her. Effectively, she chooses seclusion in her dotage, an antidote to the polite society of diplomatic dinners, trips abroad and official visits. I loved her for this! En masse, her children are presented as less than likeable, though Edith and Kay become more rounded as the story progresses. Lady Slane's key need however, is space. Even had her family been delightful, it is apparent that the protagonist yearned for what Virginia Woolf had already coined as A Room of One's Own. 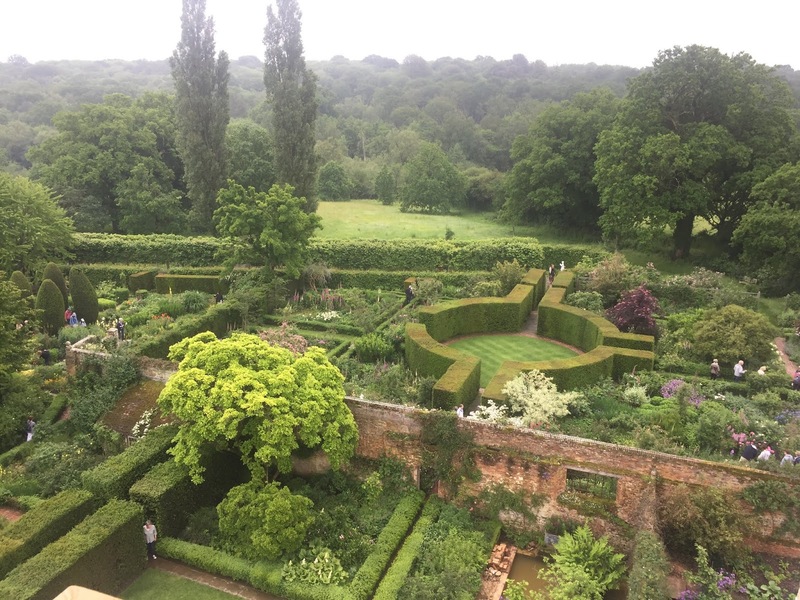 forming a spur of a walled garden is the famous Sissinghurst Tower. Used as a prison in its time, Vita refurbished it and created her very own space, a book-lined roundhouse with rugs, a settee, a fireplace and a writing desk. On her death her son confessed that he had only been in the room about six times in his whole life. She guarded the space jealously; her children had to wait at the foot of the stairs for her to come down to them. It was her space to think, to read and to write, a concept that I wholly comprehend. 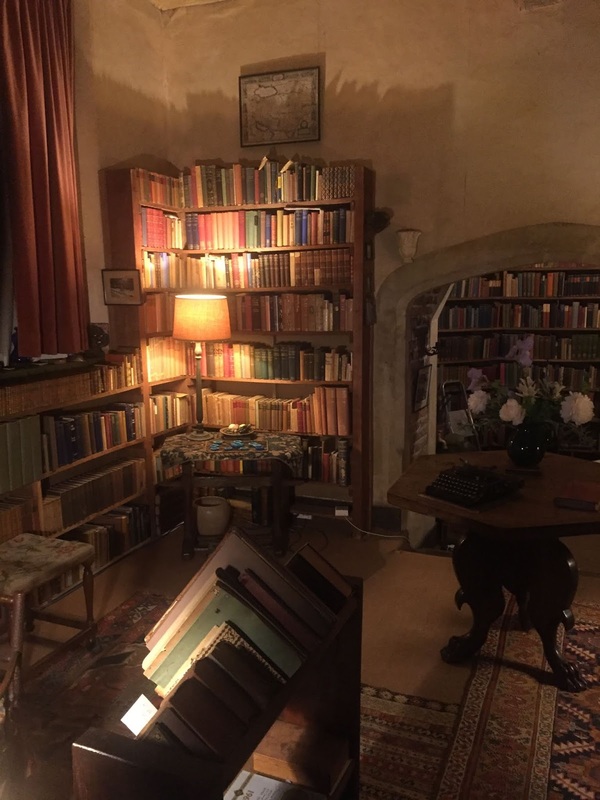 In the house of our dreams, hubby has a snooker room and I have my own library complete with a deep Sherlock chair, a fireplace, a desk and a cat! Vita just got there first! In keeping with her own fierce protection of her privacy, the National Trust have opened the doorway into the room but full access to the public is barred by a fancy grill. Hence you can see in but you cannot invade her space. 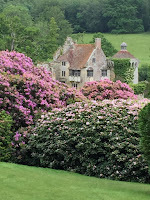 Another joyous fact in my visit to the gardens was the discovery of Sackville-West's friendship with Virginia Woolf. This latter author was the subject of an extended essay I wrote during my second year at university. 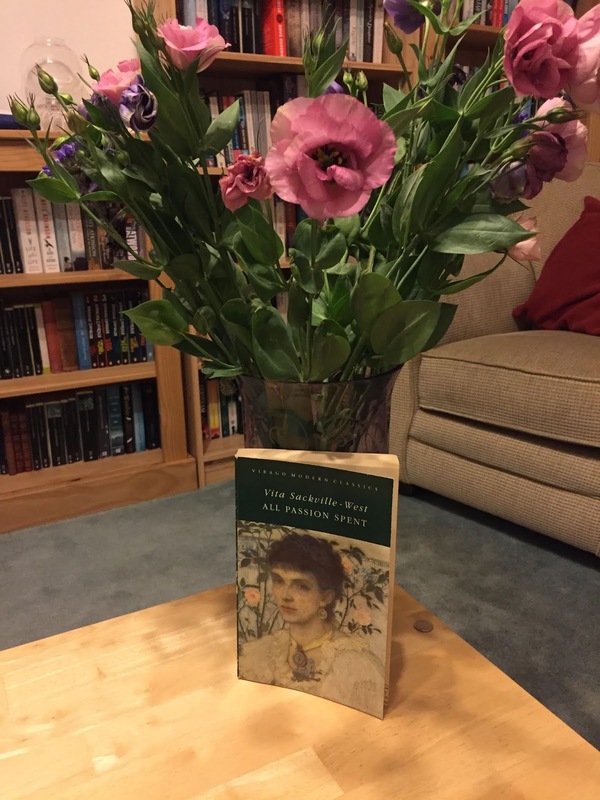 Having read and thoroughly enjoyed All Passion Spent, I must say that Virginia Woolf is the superior writer, but I am surprised that Vita Sackville-West is not a more common name in literary parlance. Scandalously ahead of their time, Vita and Harold had an open marriage where both she and her husband had other partners. One of her affairs, with Violet Trefusis, was so intense that it threatened even the Sissinghurst status quo; famously Nicolson travelled to Paris to bring her home to her children. No such scandals are depicted in the novel however; instead we are introduced to the delightful character of the lady's maid, who only a few years younger than Lady Slane, remains devoted to "Milady." Her dialogue is a mix of native French and English, creating a Franglais which must have been huge fun to write. 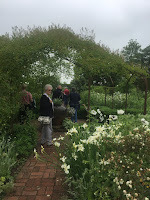 Other endearing characters are the two elderly men who become regular visitors to Hampstead, Mr Bucktrout the landlord and old FitzGeorge, an associate of Kay's who builds a friendship with Lady Slane which is kept secret from her son. All Passion Spent is a quiet read which I really enjoyed. 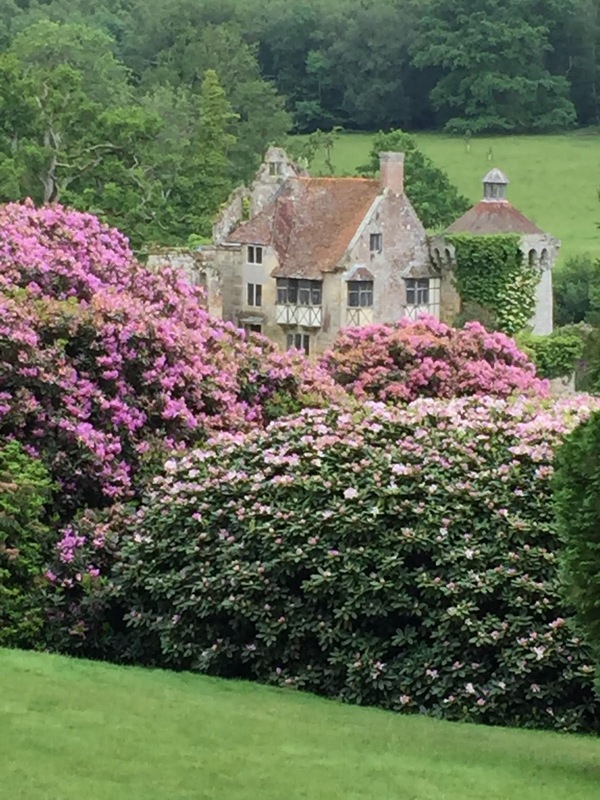 The same cannot be said of the next book that I chose to read on that holiday, having been seduced into its purchase at the second-hand bookshop at Scotney Castle. Bought with full knowledge that this would be a light read, I came late to the Jane Austen project commissioned in her centenary year. The project involved the rewriting and modernisation of her novels, to celebrate the author and perhaps encourage a new generation of readers to appreciate the gentle manners of English life she depicts. I have some Joanna Trollope titles on my shelves. She can tell a good story, and though not as highbrow as her family history would suggest, she is an author I choose when I fancy a lighter touch. But this one didn't work for me. The attempt to modernise Sense and Sensibility fell far short of the original. The story was unconvincing in contemporary Britain and I felt that the frequent need to reference email and texts was there solely as a device to force the narrative into the twenty-first century. The characters, so vibrant in Austen, were irritating and unconvincing in this version. My advice: stick to the delights of the original and if you want to give Trollope a go, choose a title of her own making rather than this adaptation which is so much poorer than the real thing.